I have a neutralizing all-natural deodorant recipe for you that keeps you smelling fresh and clean while purifying your pits!!! 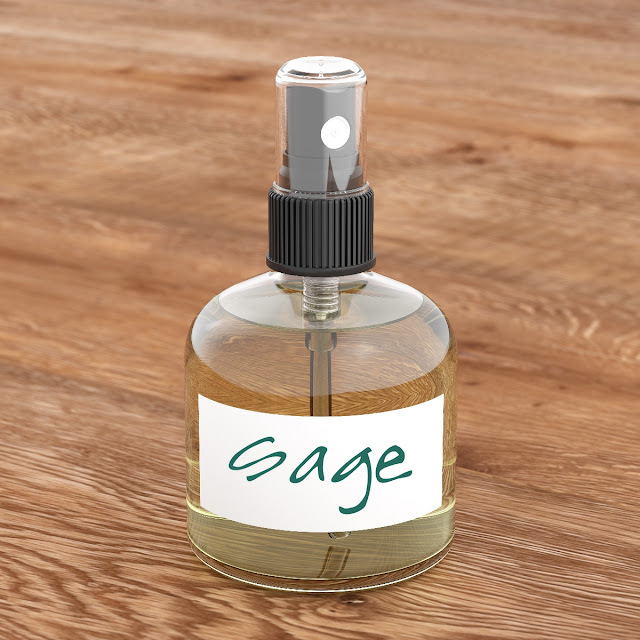 Made with vodka, Witch Hazel extract, sage tincture, tea tree essential oil and licorice root tincture, this DIY recipe smells amazing, is chemical free and works wonders! Your body will still sweat, but that is totally normal and supposed to happen. This great deodorant just keeps your armpits smelling great!!! Apply after your workout or anytime you need a quick refresh for your underarms! 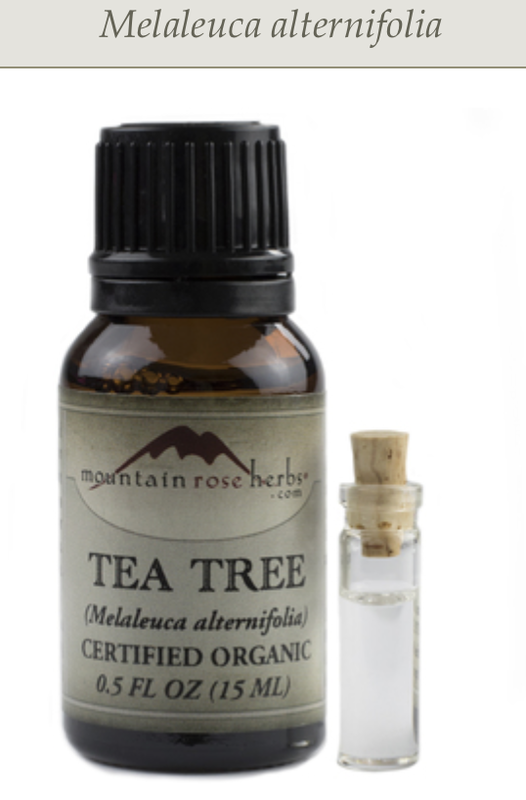 Mountain Rose Herbs has a great Certified Organic Tea Tree Essential Oil. The price is pretty good too!! As of March 24, 2017 you can buy a large 1/2 ounce bottle for just $7.50. 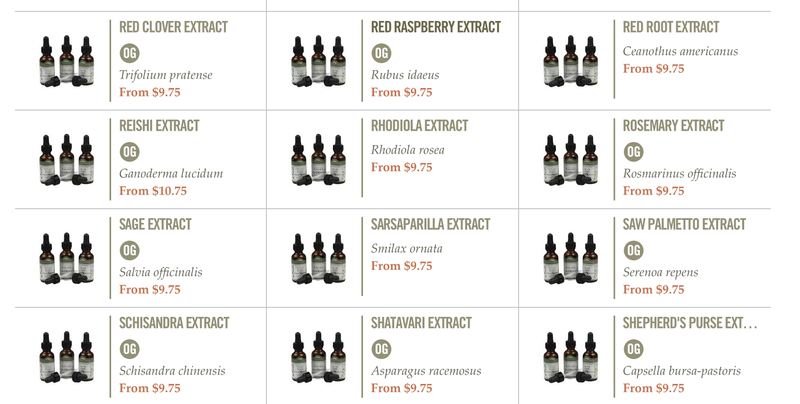 Visit Mountain Rose Herbs online HERE. You can purchase everything except for the vodka from Mountain Rose Herbs. Click HERE to visit them online. I like to use a glass spray bottle for this recipe. Add all ingredients into the bottle and shake well. For educational purposes only. We recommend that you consult with a qualified healthcare practitioner before using herbal products, particularly if you are pregnant, nursing, or on any medications. 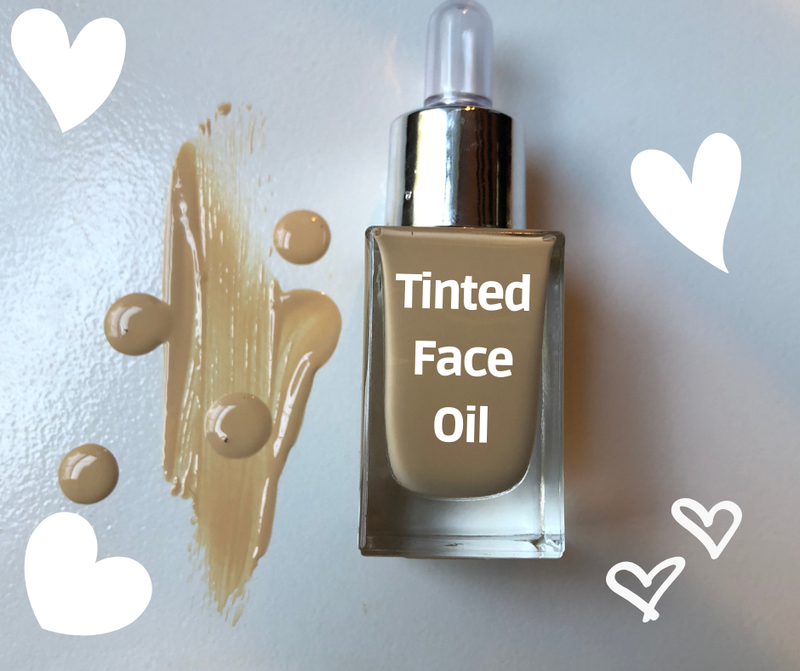 There is a really wonderful tinted face oil by Kosas Cosmetics that is basically a combination of various carrier oils, some pigments, mica, clay and other botanical extracts. The reviews of this product have been super positive and I have watched a few video reviews. I am impressed and just had to make my own version. Success! I am in love with this super cushioning and moisturizing foundation. It is light coverage and just three drops was enough to do my entire face. One of the ingredients I used is Thickening Clay from TKB Trading. You can shop HERE. It is a special clay that when used at about 3% of the formula, it helps keep the other oils and pigments suspended evenly and prevents them from sinking and separating. Add these oils into a small glass beaker. You will need to add the Thickening Clay into the carrier oils and blend with a stick blender until fully blended. You have to use a stick blender for best results because just stirring with a spoon will not work that well! I bought this little hand held blender for about $15 from Amazon and it works amazing at making different cosmetic formulas. After blending, it will look similar as the photo above. Add in the mica and silica. Blend for about one minute. Time to add in the pigments to color match your skin tone. I like to use the pre-dispersed pigments in castor oil instead of using the iron oxides. It is just easier and I don't have to make a color grind. I have a few other posts showing how to use these pigments to make YOUR color. Find them HERE and HERE. I ordered these from TKB Trading. I started with white, a few drops of yellow and a couple drops of brown. I blended it for about 30 seconds and it was just a little bit too light. I added just a tiny (half-drop) of brown and red. You really have to go slow with the pigments. It is easier to add little by little because you can't take pigments out. Pretty close in the photo above. Still a little too yellow so a tiny drop of brown and red should help. Success! It matches the way I like. Place the tinted face oil into a 15 ml glass dropper bottle. Here it is swatched on my arm in natural sunlight. This is just two drops. Here it is blended out. Pretty good match! Just three to four drops is plenty to cover your entire face. 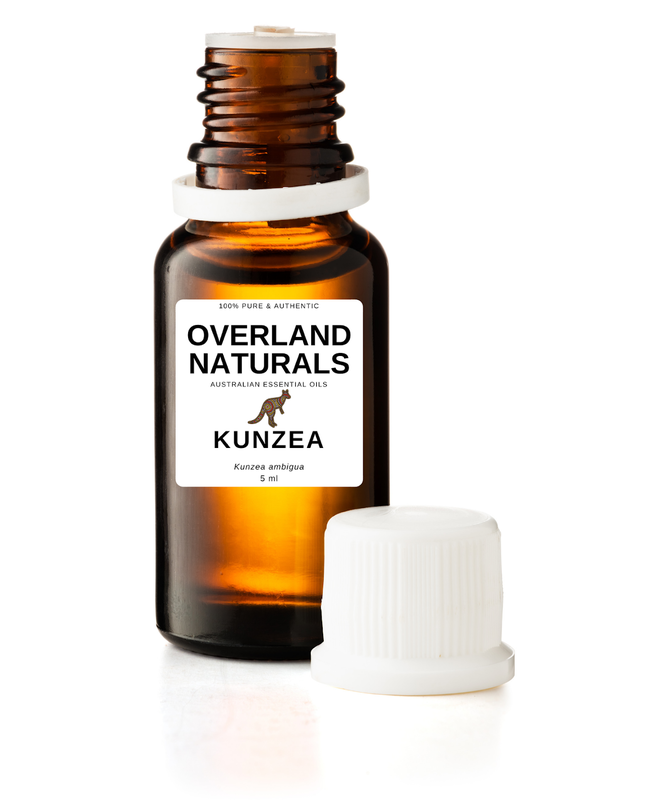 Have heard of Kunzea Essential Oil? It is one of the lesser known Australian oils that comes from wild grown bushes in Tasmania. Farmers steam-distill the leaves, twigs and flowers from the bushes to obtain the unique oil. It has a pleasing aroma profile of being somewhat earthy, a tad sweet and a little camphoraceous. 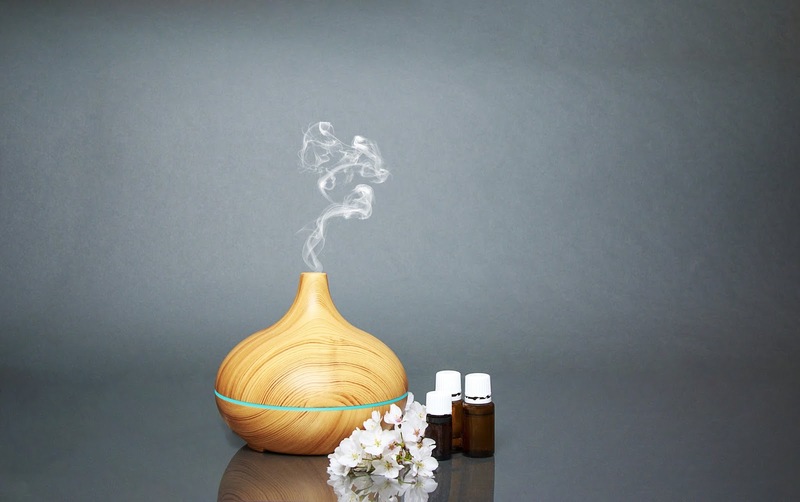 Many aromatherapists suggest it be used in an essential oil diffuser to purify the air in your home. It is frequently added to aromatherapy blends that help reduce the appearance of blemishes (great for teenagers!). Try adding a few drops of Kunzea to some hazelnut oil and applying it to blemishes. It is also used in massage blends as it is uplifting to the mood. Try adding a few drops of Kunzea oil to some liquid coconut oil and massage it over your shoulders and neck while relaxing and practicing deep breathing. 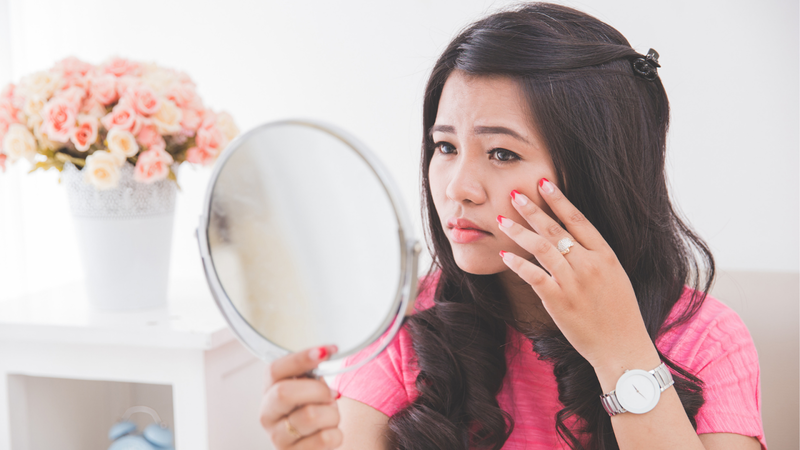 Kunzea Essential Oil can help reduce the appearance of blemishes! If you find yourself tuckered out and sore after a long strenuous work-out, prepare a blend of a few drops of Kunzea essential oil in some sweet almond oil and massage it into your sore muscles to help your body in the natural recovery process. Use Coupon Code “FRESHPICKEDBEAUTY” at checkout to get 10% off. 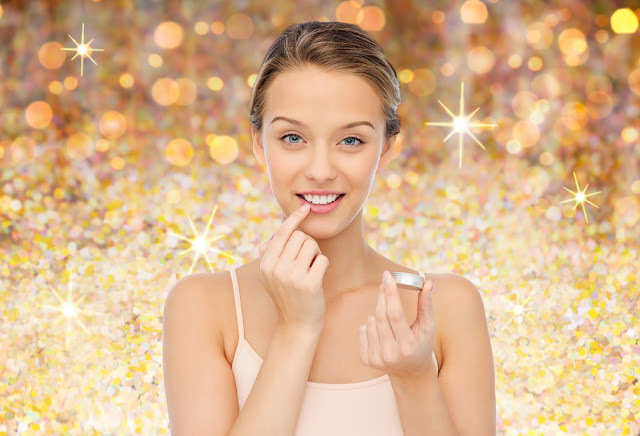 I have a hydrating all-purpose beauty balm recipe that contains a potent blend of plant oils that will soothe and nourish every inch of you!!! 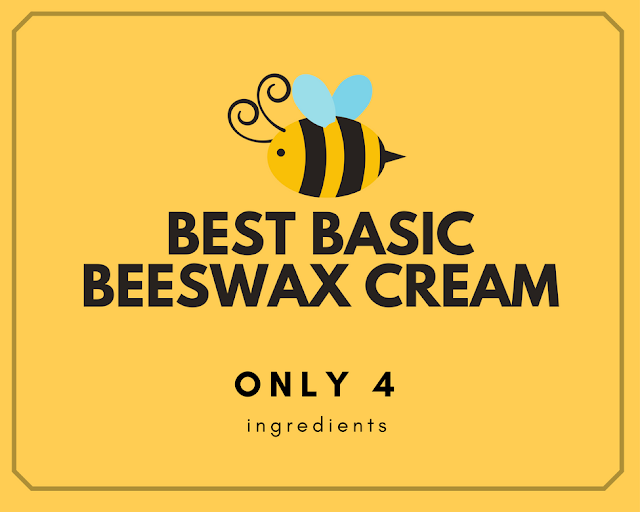 Use it as a cuticle treatment, lip balm, heel softener, cheek highlighter, elbow moisturizer, beard smoother, or even smooth your split ends. Measure out the sunflower seed oil, olive oil, grated beeswax, coconut oil, shea butter, argan oil, jojoba oil, and calendula oil into a small glass measuring cup and place in a saucepan containing a few inches of simmering water until the butters, oils and beeswax have fully melted. Remove from the heat. Add in the Vitamin E oil, Roman chamomile oil and Tamanu seed oil. Stir to combine. Carefully pour the mixture into a heat-proof glass or metal container. Allow to harden and cool to room temperature. Avoid using internally or near eyes. This is the Best Basic Beeswax Cream! Only four all-natural ingredients! You can use this as a cuticle cream, face cream, split-end mender, foot cream, and hydrating all-over body lotion. 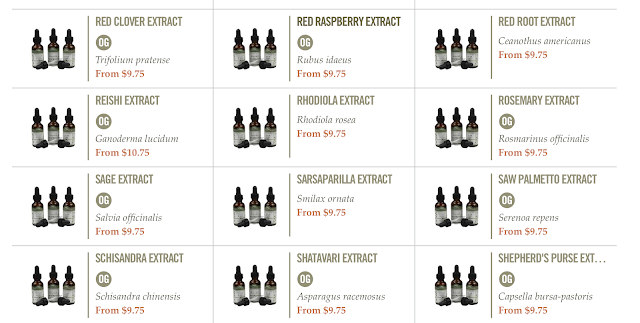 I like to get all my ingredients from Mountain Rose Herbs, you can shop with them HERE. 1. Measure the olive oil, beeswax and liquid lecithin into a glass measuring cup that has been placed in a pot with a few inches of simmering water. Allow the wax to fully melt into the olive oil and lecithin. Remove from heat and transfer the mixture to a heat-safe mixing bowl to cool to between 70 degrees and 75 degrees F.
2. Heat the hydrosol to between 70 degrees and 75 degrees F.
3. Once both phases are the same temperature, begin beating the oil/wax lecithin mixture with a handheld mixer set on medium-high speed. Very slowly drizzle in the warm hydrosol. Continue mixing for about 5 minutes or until the liquid starts to thicken and emulsify. 4. Transfer to a sanitized container and allow to fully cool down. Store in the refrigerator and use within 2 weeks. Making foundations and concealers are super fun! You can custom match the formulas for your skin type and skin color! Follow along for my formula for Color Correcting and Highlighting Concealer. You need 3.5 grams of fractionated coconut oil (also known as FCO). You need 1 gram of vegetable glycerine. I like to shop at Mountain Rose Herbs for this ingredient! Shop HERE. You need 0.3 grams of refined shea butter. You need 0.8 grams of cetyl alcohol. You can find this at Lotion Crafter HERE. You need 0.2 grams of sunflower wax. You can find it at TKB Trading HERE. Add the above listed ingredients into a small glass beaker and place it in a few inches of simmering water to melt all the thickeners into the oils. Takes about 4 minutes to fully melt. I like to use white, yellow and chocolate brown liquid pigments for my colorants. These are basically iron oxides dispersed into castor oil. The tricky part is to go drop by drop until you match your skin color. 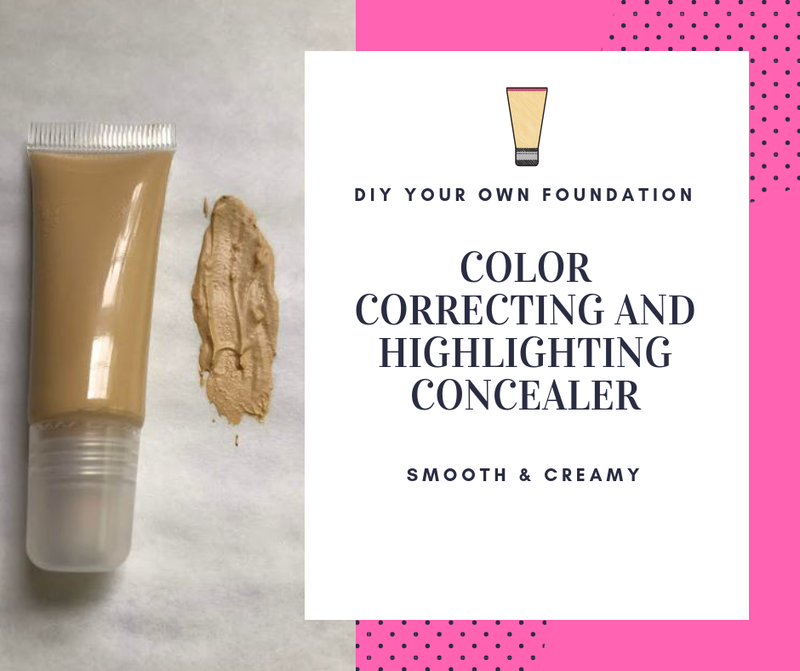 I like to formulate this base color just a shade darker because I will be adding in more ingredients that will lighten it to my perfect shade. If you have darker skin, the addition of black liquid pigment is helpful to achieve the perfect match. Start slow and work your way up. I started with 1.5 grams of white pigments, 0.02 grams of brown pigment and 0.08 grams of yellow pigment. Now you need to mix the pigments together. A little too light for me, so I need to add a few more drops of brown and yellow. Stir until smooth and blended and check the color. It should be just a shade or two darker than your skin. Perfect! I am ready to add this base into my liquid wax/oil mixture. I like to add in some TKB Trading Hilite Blue mica/titanium dioxide and iron oxide blend to give my concealer some light diffusing action and the blue helps to cancel out my redness. Just 0.03 grams was perfect for my blend. You also need 1.2 grams of white sericite mica powder. Add it into the melted concealer and mix well to disperse throughout. I use the 10 ml dispensing tubes from Lotion Crafter. These are perfect for squeezing out the perfect amount of concealer. Add the hot concealer into the dispensing tube and allow to cool to room temp. Here I am without a stitch of make up on. I decided to use the concealer pretty much all over my face and really focused on my under eyes and my pores. I have nothing else on except the concealer. It is not heavy or greasy. It does not feel sticky at all. I would like to finish it off with some setting powder to help keep it in place all day. It really works wonders and makes my redness less noticeable. I am very very pleased with the coverage. I feel it is a medium coverage that you can build up with a second layer. 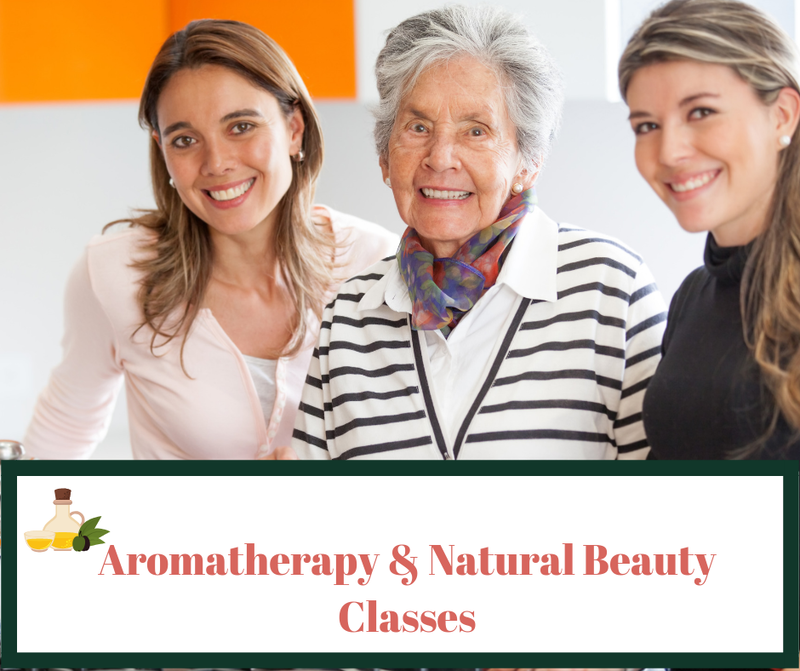 Since 2014, I have taught several continuing education classes about aromatherapy, essential oils and natural beauty in Seattle, Washington. I am available to teach both private and public classes to groups up to 25 people. If you are interested in holding a fun and exciting class for your students or employees, please email me at freshpickedbeauty@gmail.com. I have enjoyed teaching these classes for colleges, corporations and private parties. I can customize a class just for you! Therapeutic Uses of Essential Oil & Aromatherapy: 2 day class (6 hours total). Are you interested in learning about essential oils, the art and science of aromatherapy, how to properly prepare essential oils, specific therapeutic applications and how to use essential oils safely? 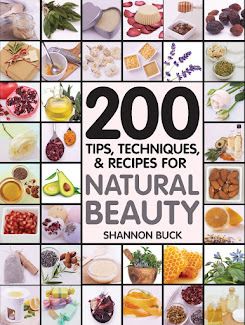 Taught by a Bastyr University Certified Aromatherapist, best-selling author and natural beauty expert. Making Holiday Gifts with Aromatherapy & Essential Oils: 1 day class (4 hours). Learn how to create sumptuous gifts for the winter holidays. Sweet Strawberry Sugar Scrub, eucalyptus and Mint Lip Balm, Holiday Herbal Body Wash, Winter Rescue Skin Serum, Enchanted Forest Perfume and Vanilla Whipped Body Butter. Spring Gifts to Make with Aromatherapy & Essential Oils: Learn how to make sumptuous gifts for Spring time. Sweet Orange and Cocoa Butter Lip Balm, Spring Time Foaming Hand Soap, Healing Helichrysum Facial Serum, Spring floral Perfume, Vanilla Coffee Body Scrub and Coconut lime Body Balm. These are the perfect self-care gifts-to give or to keep! Introduction to Essential Oils & Aromatherapy: 1 day class (4 hours). This course is instructed by Shannon Buck, a Certified Aromatherapist from Bastyr University. You will learn how essential oils are produced, how to use them safely in different applications for emotional balance, skin care and wellbeing. You will become familiar with ten essentials oils including: Lavender, Sweet Orange, Ylang Ylang, Vetiver, Peppermint, German Chamomile, Eucalyptus, Frankincense, Bergamot, and Tea Tree. You will blend your own aromatherapy roll-on to take home.